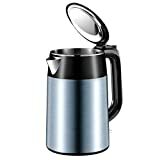 Electric kettle is the most convenient way to boil water for coffee, tea, instant soup, oatmeal, cocoa or hot chocolate, etc. Additionally, it will shut off on its own without causing danger and damage. 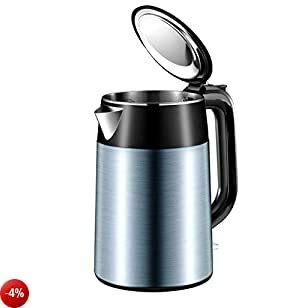 This stainless steel electric water kettle features fashionable appearance, large capacity, safe and rapid-boil technology. 1700mL of water boils in 5 minutes! You do not have to wait a long time to brew several cups of coffee for your visitors. It will shut off automatically so you do not have to stay in the kitchen, waiting for the water to boil. The handle stays cool when you touch it and the exterior is also touchable when interior water is hot. The kettle's interior wall is engraved with water lines including MAX 1.7L, 1.0L, MIN 0.5L. You can easily add appropriate water volume according your need. Attention: The added water shouldn't exceed the maximum water level or be lower than the minimum water level. It is safe and simple to use. Simply remove the kettle from the base for cord-free serving. The lid has a wide opening. You can easily reach your hand to the kettle's bottom to clean scaling. When not in use, the power cable can be twined around the base bottom for convenient storage. 1. Clean the outside and the base with a damp cloth and then dry it with a clean, soft and dry cloth. 2. Use white vinegar and warm water to remove the scaling inside of the kettle. 3. Allow the inside of the kettle to air dry before storage.